Where is the promised useable 'FIND' function? It's been months since the release of PF8 and there is still no working, useable, 'Find' function. This has been promised too many times to count. PF8, or any file manager, is worthless without a 'Find' function that informs the user not only that he/she has a given file or folder, but also informs them WHERE the files or folders are located on the hard drives. How difficult can it be to implement this? PF always had this feature in previous releases. Please focus on the important functionality of PF* instead of wasting resources to make PF8 look good under Mojave Dark Mode. That is a complete waste of effort. No one cares if PF8 looks great when it cannot tell the user where their files are located? Might as well put lipstick on a pig. I was thinking it's jus me who simply didn't figure out where the information is now location, but apearantly, the path info as provided in PF7 is no longer available?! No, it's not. And you can't even drag the path destination module over to the Find window as the Find window doesn't support modules! Idiotic! I do a keyword search for a model I worked with and I find dozens of folders for our shoots. All I know is that they are on a 20TB drive, but since that drive has a hierarchical structure, I have no better idea where any given folder is. Performing the 'Get Info' command on each folder is not efficient. Hands down, providing a Find function that tells the user NOTHING about where the files or folders are located on a given drive is the stupidest idea ever. Path Finder Support Team closed this discussion on 03 Nov, 2018 06:14 PM. It takes time to implement new features. Highest priority now is fixing issues and bugs. Path Finder Support Team closed this discussion on 07 Nov, 2018 10:05 AM. How can restoring a necessary feature be classified as implementing a ’new’ feature? Have you lost your collective minds? > Subject: Where is the promised useable 'FIND' function? > It takes time to implement new features. > Highest priority now is fixing issues and bugs. Path Finder Support Team closed this discussion on 07 Nov, 2018 02:03 PM. In other words, Jordan, you're admitting that PF8 has so many issues and bugs that your developers do not have the time to actually produce a functional file manager? BTW, where's my $20 refund you've been promising me for four months? For Cocoatech to claim this is a 'new' feature is incredulous. Path Finder Support Team closed this discussion on 09 Nov, 2018 08:44 AM. Finally received a missive from Sales claiming my refund was issued. Haven't seen anything of course, except the cancelation of my PF8 license. Never mind, I purged the PF8 malware from my system and am now running PF7 whilst test-driving ForkLift. (The developers at BinaryNights are FAR more responsive to questions. I've now got Default Folder X working with ForkLift and as soon as I feel comfortable enough, I will delete PF7 and stick with ForkLift. Cocoatech has lost a multi-year customer, probably for good. At least I know I'm not imaging things. Find is actually broken. Good deal. This whole PF8 thing has been nothing short of an abomination. PF8 was nothing more than a money grab, a fraud, a scheme. All this BS about outdated APIs and other nonsense is clearly disproven by how nicely PF7 behaves under Mojave. With a useable Find function. There was not a single reason for PF8 to exist other than to fleece the users. I wish I could go back to an earlier PF6 release actually. It never fully starts up and all you can do is force quit it. I seem to recall PF7 doing something similar too, I'll have to try 7 again. Yes, I also see PF8 as a fundraising try, however after years of close to zero activity, it looks like the team is back again and that it has a potential. I would give it some time. 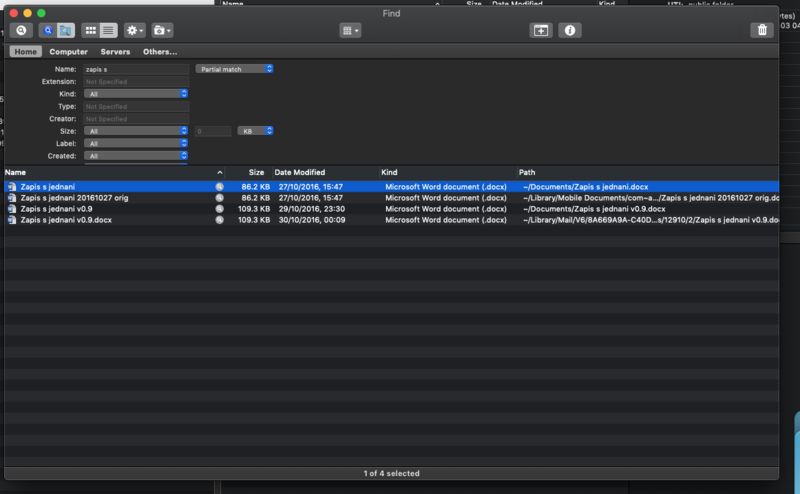 I have lots of file managers for mac - Commander One, Forklift, Nimble Commander, Crax, fman and PathFinder is still one of the best ones, so hope it will be finetuned to be really the best one. I have just sent a feedback to Cocoatech, so let`s see. Having said that - now to the topic - I do not see problem with the find dialog - path is there and looks fine. What is exactly the issue? Path Finder Support Team closed this discussion on 15 Nov, 2018 11:11 AM. There's no indication of which drive those files are located on. If one has multiple external drives, then the 'Find' function is useless. Path Finder Support Team closed this discussion on 16 Nov, 2018 09:59 AM.